Nearly every kid has asked some variation on the question, "Why do mirrors switch left and right, but not up and down?" Maybe you still ask yourself that question too - it doesn't seem to make sense. After all, there's nothing special about "left and right" vs. "up and down" as far as a mirror goes. If you lean sideways, it still looks like your left and right are being switched, leaving your up and down the same. That's the clue to solve the mystery: mirrors actually don't reverse left and right, however it may look. It's a common misconception - I've even seen science museum displays say it. If you really want to see what mirrors do, hold your hand up between your face and the mirror with your palm toward the mirror, so that you can see both your hand and its reflection at the same time. You see the back of your hand, but the reflection shows the palm of your hand, a view you aren't able to see without the mirror. The mirror is actually reversing front and back! The front of your hand (the side you see without the mirror) is the back of your hand in the reflection. We can see why mirrors fool us into thinking left and right are swapped, though: it looks like a second person is standing in the mirror, looking back at us. When you raise your right hand, the mirror person appears to raise her left hand. However, what's really happening is that the mirror person is still raising her right hand, just that the front of your hand is the back of hers, the front of your head is the back of hers, and so forth. If the mirror really flipped left and right, the mirror person would be facing the same way you are: you'd be seeing the back of her head instead of her face! Ordinary bathroom mirrors are flat, but there a kind of mirror that flips left and right as well as front-to-back - but it also reverses up and down, too. This type of mirror is a concave mirror: one like the inside of a polished metal bowl or the cupped part of a soup spoon. Again, you've probably played with making faces into a shiny metal spoon: one side gives you an upside-down reflection. (I'll talk about the other side of the spoon in a little bit - that's a third kind of mirror.) A spoon is kind of an odd shape, since reflecting your image isn't their main purpose, but many makeup and shaving mirrors are closer to being ideal concave mirrors. 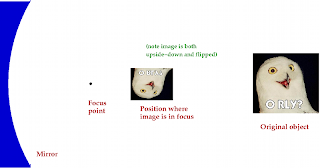 The upside-down and backward image you see will always appear smaller than you are, but it will also seem to be closer to the mirror than you are. Unless the mirror is nearly flat, your face will appear to be distorted: a big protruding nose and smaller ears fading in the distance. If you sway left, your image will sway right; if you duck down, your image will bob up. 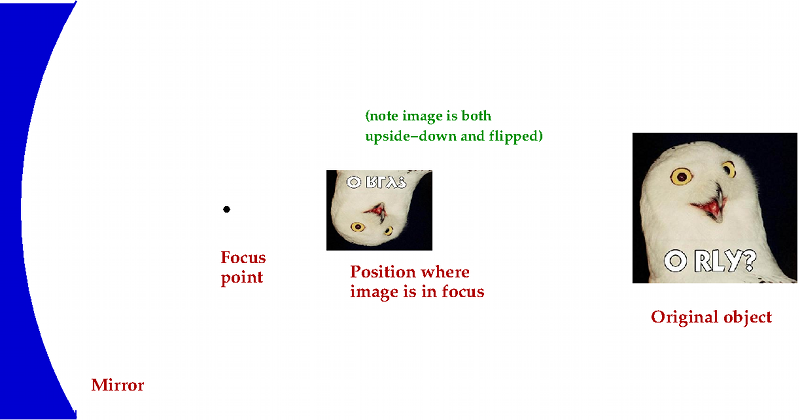 That's how we know the image is truly reversed, unlike the flat mirror! A big concave mirror can be a bit headache-inducing (at least if you're like me): the image looks very strange compared to the image in your bathroom mirror. That's because it's what is known as a real image: it's on the same side of the mirror as your face, so your eyes have a lot of trouble focusing on it. In fact, if you put a piece of paper at the right location, you can actually project the image from a concave mirror onto it. There's a special distance from the mirror known as the focal length, where the light focuses. A very curved mirror has a small focal length, while one that is nearly flat has a large focal length. (Also, the flatter the mirror, the less distortion you see in the image.) If you stand close to the mirror than its focal length, your image will be right-side up and magnified. That's the real reason many makeup and shaving mirrors are concave: they have large focal lengths, so that your image in the mirror is slightly larger than your actual face - and appears closer to the mirror than your face really is. You can guess the advantage of that: you can see your eyelashes or the contours of your face more clearly. microwaves instead of visible light, which is why they don't look like mirrors at first glance. Again, the purpose is to focus the signal from the satellite. Big radio telescopes are also mirrors: the biggest mirror in the world is the Arecibo radio telescope in Puerto Rico: that one is 1000 feet (305 meters) across! If you still have your spoon from the previous section (and I hope you do - the author is not responsible for lost utensils), turn it around so that your image appears right-side up. This type of mirror is convex: like the flat mirror, it flips back and front, but not left and right. Like the concave mirror, it distorts your image, but makes your face appear farther away than it really is. mirror that bows inward. Convex rhymes with "flex": that's a mirror that bows outward. At least that's how I remember which is which! The passenger-side mirror of a car bears the message "Objects in mirror are closer than they appear". (Hopefully the object is not a tyrannosaurus.) That mirror is convex, and it's designed to give a wider view of the side and rear of the car than can be done with a flat mirror. The price of the wider field of vision is that objects do end up looking farther away than they really are. You also see convex mirrors in shops, so that the staff can look down aisles out of their direct vision, and in a famous self-portrait by M.C. Escher. makeup mirrors to the biggest telescopes in the world, and shop mirrors to cars. Even better, you probably have all these types of mirror easily accessible, especially if you're willing to goof around with spoons. Try them out, see how they work, and the next time someone tells you that mirrors reverse left-to-right, you can help get them facing back the correct way. Sorry, but I don't quite buy it. Say I am wearing a shirt with my name over the left pocket. In the mirror I see someone with a reversed name over what would be their right pocket. I wave my right hand, this person waves what would be their left hand. Move to a pair of mirrors joined at a right angle. I see a person with the unreversed name over what would be the left pocket. Wave the right hand and that person waves what would be their right hand. I see what you are getting at, but it is really contrary to the nature of mirrors. What you are thinking about is a TV screen attached to a camera behind the viewer. What I'd really like to know is how a mirror reflects accurately all the colors visible in it while simultaneously appearing to be entirely silvery. For your objection: imagine if you're transparent. Someone standing behind you would see the lettering on your shirt appear backwards. Reversing front and back in a mirror image has that same effect. I do understand your objection, but again: if a mirror really reverses left and right, it would also reverse up and down since there's nothing special about "left and right". Compare with what happens in a concave mirror, where reversal really does happen. For your second comment: a mirror isn't perfectly reflective, so not all the light reflects back to us. It bounces the colors back to us, but some still get scattered or absorbed, which leaves the silvery impression you note. Tnx! The transparent me makes it transparent to me. Yes, you're right: for the ORLY? Owl example, I considered what's called a cylindrical mirror, where only the top and bottom are swapped, but the left and right are not. That was for reasons of simplicity.